The European Centre for the Development of Vocational Training (Cedefop) introduces the European Skills Index (ESI) today in Brussels. The index allows one nation’s performance in skills systems to be compared to another’s in order to bring about improvement. The launch today reveals the results of the 2018 update. Cedefop’s ESI is a composite index that measures the performance of a country’s skills system. The Index makes it possible to gauge the relative performance of Member States’ skills systems and, in doing so, make a substantial contribution to the policy discourse on skills, employment, and growth. The ESI distinguishes three pillars, one for each stage of the skills system: Skills Development, Skill Activation and Skills Matching. Each pillar consists of sub-pillars within which lie the individual indicators used for constructing it. Cedefop expert Ilias Livanos will present the Member States performance in skills systems as measured by the Index. Examples of how this tool can be used to explore a country’s skills system and identify areas with improvement prospects will be provided. Members of the European Commission, International Labour Organisation and research entities will participate in a panel debate looking at the implications of the index results for skills and labour market policies, and discuss how the ESI can be used as a policy tool. More than being just another number that allows the ranking of Member States, the ESI score can lead to more informed discussions on skills systems at EU level and national level. Therefore, ESI should be considered more as an intra-EU cooperation tool then a bench-marking tool. Policy makers in the Member States should look for their “ESI neighbour”, i.e. which Member State is doing better than them in one aspect of the skills system, and learn what policies or what economic factors have led to that improvement. Take Germany and the Czech Republic, for example. Both Member States seem to have similar performance in two aspects of the skills system: development and activation. The difference is in the last pillar – skills matching, in which Germany can learn from the Czech Republic’s know-how. The ESI scores show that there is still significant room for improvement in the skills system of each Member State. 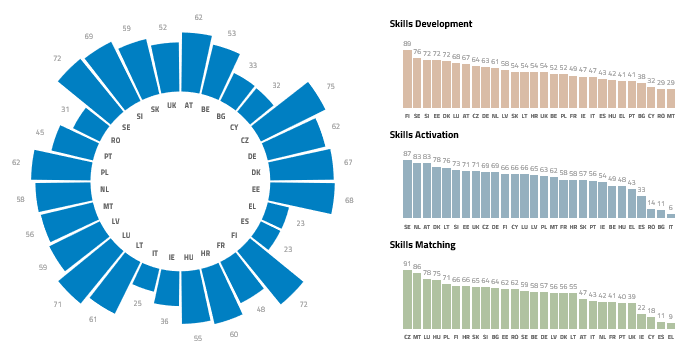 Even Member States with the top-performing skills systems (i.e. the Czech Republic, Finland and Sweden) have room to improve further. Finland, Sweden and Slovenia are countries where most good practices for Skills Development are to be found. Sweden, the Netherlands and Austria could share with the other Member States their good practices in Skills Activation. The Czech Republic, Malta and Luxembourg have the best performance in terms of skills under-utilisation and skills mismatch. Click here to find out more on the event on the Cedefop website. To find out more about the ESI results, please consult the ESI dedicate page on Skills Panorama website.